2 Lego posts in one week! I must be crazzzzy. Here's something you might not know: there's an active adult Lego community in Ottawa. ParLUGment (which is a play on Parliament and LUG or Lego User Group) is only open to adults. We put on displays locally and attend international fan festivals to share the love of our hobby and our desire to create original work with Denmark's building toy. The group's site is pretty light in content, although it does provide their upcoming meetings and a short list of events where they are planning to display their creations, as well as links to photos of their members' creations. 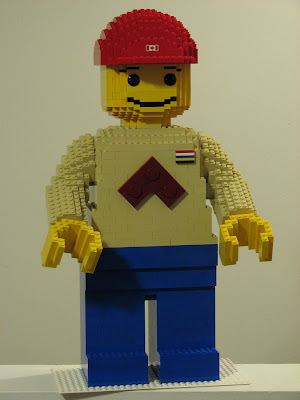 My personal fave is the super meta Lego minifig below: a Lego man made out of Lego bricks. Genius. This Family Day weekend you an check out some of their work at Funatorium Explorium's Family Extravaganza (be warned though: this event is $20 per person). ParLUGment will also be displaying at other events throughout the year. Check their site for details. Find out more about ParLUGment.